If you could leave this life with either a lot of money or a lot of EXPERIENCES AND ADVENTURES… which would you choose? If you’d pick “life experiences,” then I built my new touring bicycle video course especially with YOU in mind! The “Your First Touring Bicycle” video course is my new online training program designed for anyone who is tired of the daily grind and is dreaming of a grand adventure on the seat of a bicycle, but doesn’t yet know how to get started with bicycle touring. 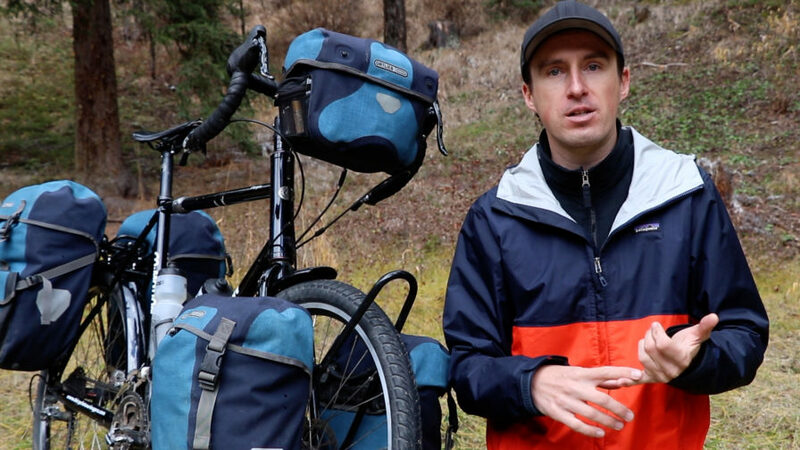 This new 14-part video course covers everything you need to know before purchasing your first touring bicycle! It’s also designed for those who may have made the mistake of thinking that just about any bicycle would do… and ventured out on a bike tour of their own, only to discover that they had the wrong bicycle or equipment, which made their time on the road either uncomfortable, unpleasant or downright impossible. 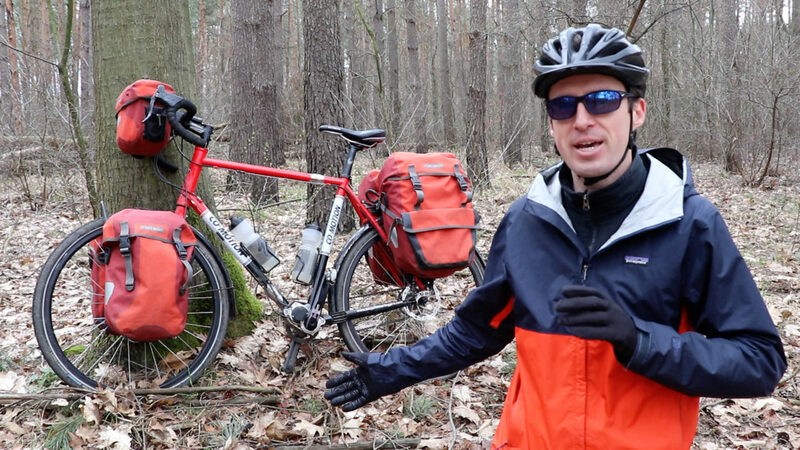 By the end of my new video course, you will learn the exact characteristics you need to look for in your perfect touring bicycle. Then, we will use your newly acquired knowledge to help you pick out the best touring bicycle for YOU and the type of bicycle touring you wish to conduct most in the future. I’ve been bicycle touring around the world for the last 19 years and I’ve ridden a number of different bicycles in that time. Some of these bicycles worked, but were uncomfortable; others were so bad they made my life on the road a complete suffer-fest; and other bicycles have made my cycling experiences so enjoyable that I almost forgot I was riding a bicycle at all. Now that I own a proper touring bicycle and have toured the world in complete comfort (due to the fact that I chose the right bicycle for me), I can confidently tell you that having the proper bicycle and equipment has made all the difference… and I want you to have that experience too! 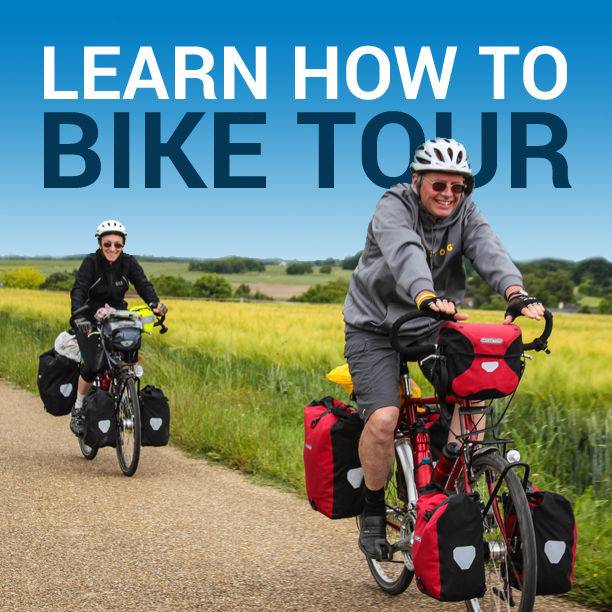 Sign up for my new 14-part video course on touring bicycles today! Enter the coupon code: BLOG123 to receive $50 USD off the normal price of the course and get access to my new video training for only $47 USD. When I was a teenager, I watched the movie Forrest Gump so many times that I learned to recite most of the words in the movie by heart. That movie changed my life in many ways. From the moment I first saw Forrest Gump, I was obsessed with the idea of running across the United State just like Forrest did in the film. Every night after finishing my homework and dinner, I’d spend my free time planning my route across the USA and figuring out which roads Forrest Gump was running on in the movie, so I could run those same roads on my own epic adventure across the United States. During my research for the run, I discovered that there was a fascinating world out beyond my suburban neighborhood where I grew up in Southern California, and I very quickly realized that instead of staying in one place my entire life, I wanted to live a life full of adventure and experiences. Fast forward a few years and I’m ready to start college. Before I begin, I decide to venture out on my own for the first time in my life and finally have that Forrest Gump running adventure I had been imagining throughout high school. After a three-day training run near my home, however, I knew that running across the United States was not going to be easy. I could barely walk due to the stress I was putting on my legs and body… and I was frustrated with the fact that as a runner, I couldn’t carry anything with me (such as food, water, clothing, camping equipment, etc). So, I came home from that three-day training run feeling very defeated. I told my Uncle Tom how disappointed I was after my training run… and he was the one who suggest to me that, instead of running across the United States, I should consider riding my bicycle. That way I could cover longer distances, carry everything I needed for the trip with me, and not put my body under such extreme stress and punishment. It was an amazing idea… and with newfound hope, I began planning a new adventure (this time, on my bicycle)! So, the summer after graduating from high school, I grabbed my father’s old Schwinn mountain bike out of the garage and boarded a bus to the California/Oregon border. After exiting the bus with my bicycle in tow, I rode that rusty old bike all the way down to the Mexico/USA border in Southern California. It took me 30 days! I survived the trip, but riding that old mountain bike made my body miserable, as the bicycle I was using at the time wasn’t designed for carrying heavy loads… or to be ridden for hours on end each day. The following year, on my second bicycle touring adventure, I spent a month riding that same Schwinn bicycle across Kansas, Colorado and Wyoming. It squeaked and strained the entire time… and riding it made me extremely sore and uncomfortable. Because the bike only had flat handlebars, I couldn’t move my hands around as I cycled, so after just a couple weeks on the road, I began to suffer the affects of nerve damage – as I had an extreme pain running through my left hand, wrist and elbow. The pain was so bad I could barely move my left arm and was unable to perform simple tasks, such as showering or opening packages of food. When I reached Rawlins, Wyoming after a little more than a month on the road, I knew I could go no further with my bicycle. It had reached its last leg… and so had I. I wanted to keep going, but my bike and body were done. We had had enough. It was time to go home! So, I boxed up my bike, boarded a Greyhound bus and rode for the next day or so with a tribe of Native American firefighters back to my home in Southern California. Almost 20 years later now, I’m still disappointed with the fact that I had to quit that bike trip – even though since that time I have successfully traveled the world and visited over 80 countries on my bicycle. I didn’t realize, at the start of that bike tour, however, that I could have had an enjoyable bicycle touring experience if I had only been riding a proper touring bicycle. I learned a valuable lesson on that trip, however, and I want you to learn it too. My failed bike tour taught me a valuable lesson: I learned that if I was going to do any type of travel by bicycle and be able to remain comfortable and in good health while carrying everything I needed for my trip with me on my bicycle, I needed a proper, well-functioning bike. Not just any old bike was going to do! Think about that. I’m a regular guy who has now traveled the world by bicycle since 2001… but had to QUIT on one of my early adventures because I was using the wrong bicycle and had to return home on a bus. Yes, now I can travel the world on two wheels and be both comfortable and efficient, but the key to my success today was first finding the right kind of bicycle for what I wanted to achieve. Doing research on the different kinds of bicycles is what ultimately led to my long-term success as a bicycle traveler. You have to understand… at the time I was first starting to travel by bike, no one was teaching people how to conduct successful bicycle tours! There weren’t any books on the subject of touring bicycles… and there certainly wasn’t an online course that would teach you how a touring bicycle was different from other types of bicycles (such as road bikes, mountain bikes, hybrids, etc). I spent all my free time speaking to knowledgeable people in the cycling world… and finally educated myself on what I needed from my bicycle… before I ultimately went out and bought my first touring bike! What an incredible difference my new touring bicycle made on my travels! Not only have I now cycled across more than 80 different countries around the world, but I’ve never had to quit a bicycle trip due to injury or mechanical failures since that time! How Do YOU Get Started With Your Own Bicycle Touring Adventures? They go to Google for answers… and it doesn’t take long before they get completely overwhelmed. There’s so much conflicting information out there… and you’re left on your own to simple cobble it all together and come to a decision on a bicycle that is going to cost you a thousand dollars or more. Buying a bicycle is a huge investment… and you don’t want to waste your time or money purchasing the wrong kind of bicycle! While some people go to Google for answers, others ask the people working at their local bike shop(s) for help. This seems like a good idea at first, until you learn that most local bike shops do not carry touring bicycles of any kind (as most bike shops only carry road bikes, mountain bikes or hybrids) and the people working at these shops rarely have any knowledge on touring bicycles of any kind. Many bike shop workers will even try to sell you some other kind of bicycle (a bicycle that isn’t designed for multi-day bicycle touring at all ) – just so they can make a little money off of you. I can’t tell you how many times my Bicycle Touring Pro readers have written to me and said that this is exactly what happened to them. They went into their local bike shop to buy a touring bicycle, only to walk out a few minutes later with a hybrid bicycle or a road bike equipped with a rear rack… only to discover a few days later that the bicycle they just paid thousands of dollars for isn’t actually a touring bicycle at all. You Do NOT Want This To Happen To You! Here’s the thing: You want to make sure you learn everything you can about touring bicycles BEFORE you actually go out and make the investment in a bicycle that you are potentially going to be riding for the rest of your life. Buying a new bicycle is a huge investment… and you want to make sure you get the best bicycle for you (a bicycle that has been designed for the type of cycling you wish to conduct most in the future). Over the last decade, thousands of my readers at www.bicycletouringpro.com have purchased my book, “The Essential Guide to Touring Bicycles” to learn what they could about touring bicycles before going out to purchase a bicycle of their very own. And since that time, I have received thousands of emails, messages and testimonials from people all around the world, thanking me for helping them purchase their first touring bicycle. My readers have told me they loved “The Essential Guide to Touring Bicycles,” but wish they could SEE what I was actually talking about when I mentioned certain characteristics on a touring bicycle. So, I’ve spent the last six months working on the “Your First Touring Bicycle” video course… and I have put all of my knowledge and years of experience into this 14-part course on touring bicycles. This 14-part video course has been designed to help you learn what a touring bicycle is; determine which type of touring bicycle is going to be best for you; and equip you with the information you need to go out and purchase a touring bicycle of your very own. Anyone embarking on a bicycle tour at some point in the future. Individuals who have the goal of traveling by bike across their home city, state or country. People who dream of traveling around the world on their bicycle! The “Your First Touring Bicycle” video course is a program built for people who want to live big, unconventional lives and have grand adventures via bicycle. If you watch all 14 videos in this new course, I know you’ll not only learn a ton… but you’ll come out on the other side, with enough knowledge and information to go out and confidently choose the best touring bicycle for you! In the 14th and final video inside my course, I even walk you through the process of taking any basic touring bicycle and building it up with all the pedals, fenders, racks and bags… so that in the end, you have a finished touring bicycle that you can use to conduct your own incredible cycling adventures anywhere in the world. Click here to access the registration page for the “Your First Touring Bicycle” video course. Fill out the form on that page… and be sure to enter the coupon code: BLOG123 to receive $50 USD off the normal price of the course. Then enter your payment details to complete your registration. As soon as you’ve done those three things, you’ll have instant access to all 14 videos inside my touring bicycle video training course. It’s very easy… and only takes about three minutes to complete the registration process. So… what are you waiting for? Sign up right now… and start your touring bicycle education straight away! Your Dream Touring Bicycle Is Out There! Click here to register for Bicycle Touring Pro‘s “Your First Touring Bicycle” video course and save $50 USD when you enter the coupon code: BLOG123 at checkout. I can’t wait to get a photo of you with your new touring bicycle and add you to my ever-growing list of Bicycle Touring Pro success stories. This entry was posted in Bicycle Touring Pro Articles, Bicycles, Featured Articles, Featured How-To Articles, Main Articles, Main Featured Articles, Touring Bicycles, Uncategorized, Website Announcements and tagged adventure cycling bikes, best touring bicycle, best touring bicycles, best touring bike, bikepacking bicycles, different types of touring bicycles, gravel bikes, how to find a touring bicycle, touring bicycle, touring bicycle video course, touring bicycles, touring bike, touring bikes, trekking, trekking bikes, video course, your first touring bicycle.